There once was a little farm girl who loved to read. Every Saturday she would climb the long stairs in front of the library. She would put her hands on the brass handles of the huge wooden library doors and push them open. Then she would walk to the tall shelves that were filled with books. She would look up and down the books. Finally, she would select one book to take home for the week. Oh, how she loved to read! Then something sad happened. The little girl broke her leg. For several weeks, she would not be able to climb the stels to the library. The girl's sadness did not last for long. Un her books, she haf read about people who used animals to help them in their daily lives. Blind people sometimes used trained dogs to help them find their way around, Some people who cannot use their hands have trained monkeys that can help feed them and give them water and do other duties. The little girl decided to train one of her farm animals to help her. The sheep said it was a "Baahd" idea. The cow was in a bad "Moo-ood." So, the little girl trained a chicken to help her. The chicken hopped up the library steps. It politely waited behind several people going through the library doors. The chicken flapped its wings and bobbed its head up and down as it looked up and down the library shelves. 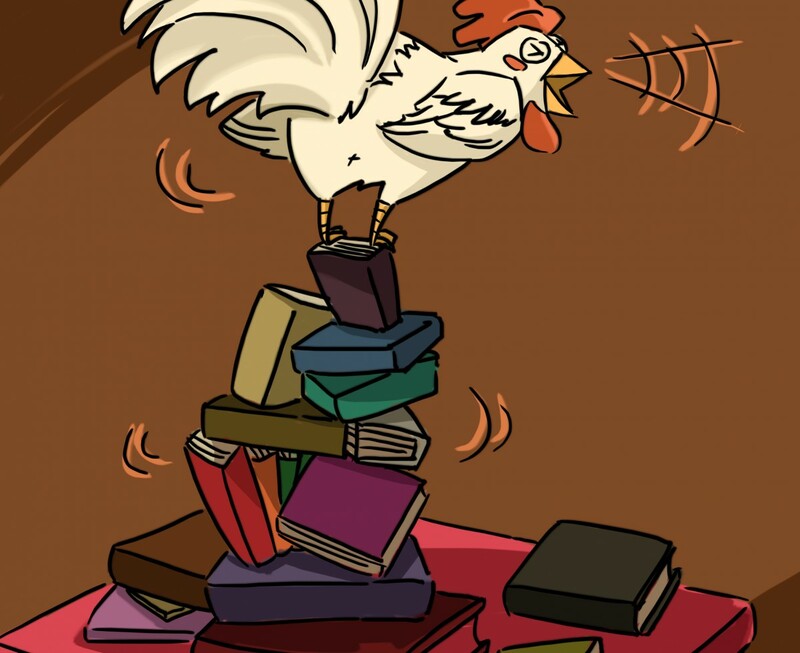 Then the chicken said, "Book, Book, Book," over and over again until the librarian picked a book out and checked the book out for the chicken. Then, the chicken carried the book home to the little girl. The little girl read the book and sent the chicken back with the finished book to check out another. This worked very well until the librarian sent a book home the girl had already read. She tried to teach the chicken to talk so it could return the book for a different one. But, though the chicken was smart, it could not learn how to give this message to the librarian. The little girl knew it was important to not give up when trying to solve problems. So, she thought and thought until she had another good idea. The next time the chicken tried to return a book for a new one, the girl sent her pet frog with the chicken. The librarian asked,"Why are you bringing the book back so soon?" The frog jumped up on the librarian's desk and said, "Read it, Read it!" This allowed the librarian to check out a different book for the little girl. She had plenty of books to read until her leg was better and could go to the library herself.